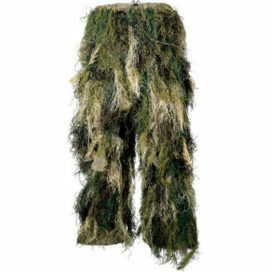 Whatever your ghillie camo needs are, we have you covered! 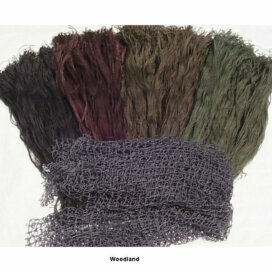 If you need a ready to wear ghillie we have plenty of those to choose from. For those that want to make their own custom suit we have Jute or Ultra-Light Jute material and netting, or you can buy a complete kit. 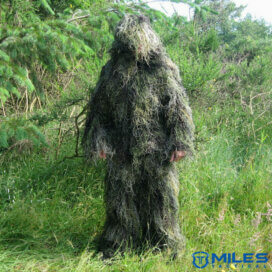 You can perfectly customize the pattern of your ghillie suit by adding vegetation or dying the suit to your liking. You may have seen recent pictures or movies of someone so cleverly concealed you wondered, “how do they do that”? 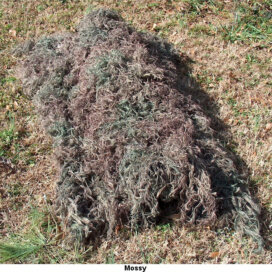 If it has anything to do with military sniper operations you are probably looking at the potential of a ghillie suit. 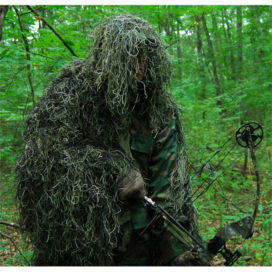 The purpose of a ghillie camo is to break up your shape and make the person blend into the elements surrounding him/her. 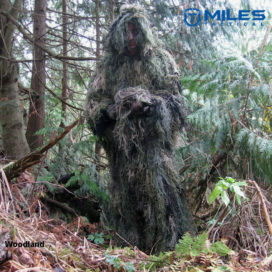 One of the main concerns of a sniper is the art of camouflage, and part of a sniper course involves building and effectively using a ghillie suit. Nothing in nature has perfectly straight lines, so equipment like rifles and antennas often betray concealed positions. To counter this, snipers also make little ghillies for their rifles. 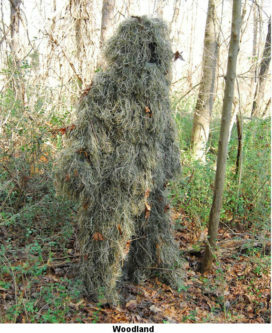 At TheGhillieSuits.com, you can get Ghillie suits in a variety of shapes and sizes. 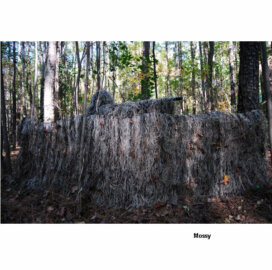 The most cost effective way of getting into a Ghillie is by building your own using one of our kits. The standard kit will give you full head to foot coverage and our tracker kit gives you partial coverage. You can choose from 4 patterns: Woodland, Mossy, Desert and Leafy. 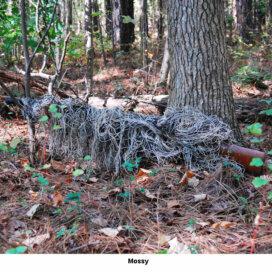 This will give you the colors necessary to make that pattern Ghillie suit. You may also choose your own colors by purchasing our Custom Kit. 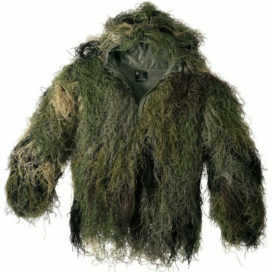 A decent jacket and pants Ghillie suit is by far the most popular choice because of the comfort and freedom it offers the user. The ability to easily run and jump gives you an advantage when hunting and scenario gaming. This freedom of movement and flexibility is not possible with a full coverage Poncho. A poncho style suit is like a long jacket. Generally there is no zipper so you simply pull it over your head. Our tracker poncho comes with a built in hood covers down to your waist. This makes it great for mobility. You can pair this with one of our Pants if you need lower coverage. The standard full coverage poncho suit conceals you from head to foot. 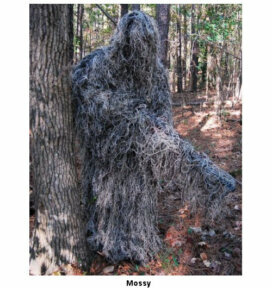 This type of Ghillie suit will slow you down and is recommended for situations where little movement is required; hunting out of a tree stand or turkey hunting. Our toughest, most durable and highest quality suit would be the BDU (Battle Dress Uniform). We have this available in either Jute or Ultra light synthetic. With the Jute version we take a set of BDU’s and sew the Jute material onto the BDU. The Ultra light BDU Suits are our latest addition and allow you to customize the suit from the pattern of the BDU’s down to the pockets. The Ultra light BDU suits are different from the Jute version because instead of sewing the Ghillie material onto the BDU’s, we instead sew on our netting and tie the material to the netting. This is great because you can easily enhance the pattern of the suit by adding local vegetation into the netting. 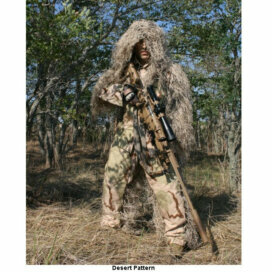 Both the Jute and Ultra Light BDU Suits are available in the Sniper style. 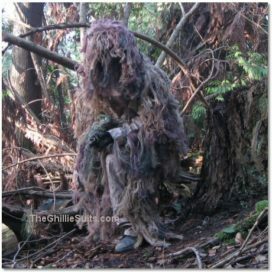 With this style we leave the front bare of Ghillie material and instead sew on a layer or extra cordura for better durability during sniper crawling.